The SCOAN Choir’s rendition of “Abba Father” – a song composed by Prophet T.B. 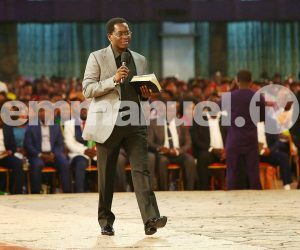 Joshua, saw the atmosphere within the auditorium charged, as the congregation sang along joyfully, asking God to take their hearts away from fleshly desires. Expatiating on his opening statement, Racine emphasised that we tend to limit ourselves to believing that what we read in the Bible is not meant for us but rather for the people in the Bible. He submitted that we are too conditioned to believe that what God says can happen to others, will not happen to us. To demystify such conditioned belief, Racine reminded the congregation and viewers all over the world that the grace of God that transformed a tax collector Levi into the Apostle Matthew; the grace of God that offered a murderer, who had been sentenced to die on the cross, eternal life; the grace of God that transitioned a state persecutor named Saul into an Apostle Paul, is the same grace that gave us a prophet to all nations, a mentor to millions and a channel of shining light in our time – Prophet T.B. Joshua. Racine’s references illustrate that what God made happen to others in the Bible, He also makes happen to those in our life’s time. This means that God’s promises can be fulfilled in our lives, once we believe. 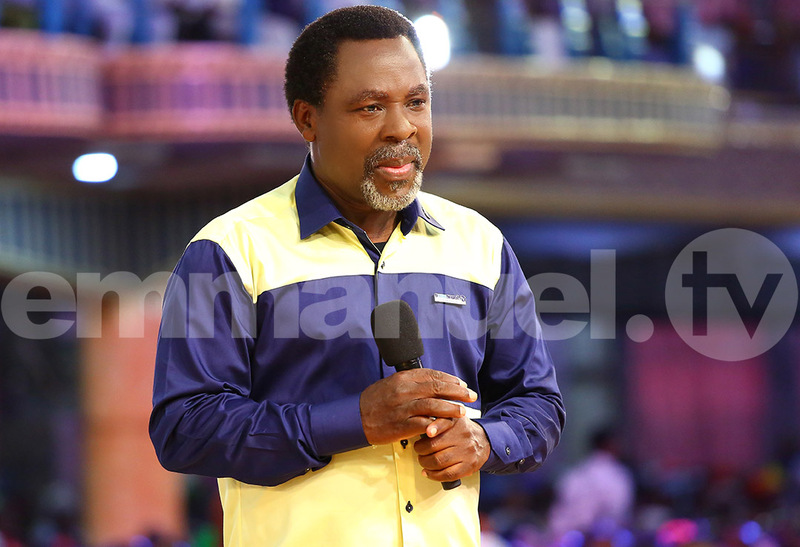 In ushering us to the title of his message “THE TRANSFORMING POWER”, Racine added that when you allow God to transform you by the power of the Holy Spirit, then He will literally begin to show you the way. Reading his proof text from Genesis 1:1–5, Racine encouraged the faith of the congregation and viewers all over the world to embrace Good Morning into their lives, careers, destinies and to follow Jesus Christ, who will remove every void in their lives and transform them from darkness to light. In delving deeper into the underlying premise for our conditioned belief, Racine cited a few cases in point. 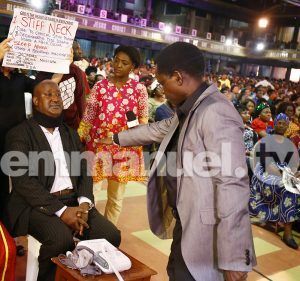 When Prophet Samuel (1 Samuel 9:21) went to anoint Saul as a future king, Saul’s thoughts flashed back to his background as a Benjamite or one of Israel’s least tribe. Gideon reminded himself of his impoverished family situation when an angel was sent to establish him as a judge in Israel. When the Lord engaged Moses to lead His people out of captivity, Moses referred God to his non-eloquent weakness. Referring to John 15:3, in which Jesus spoke: ‘You are already pure because of the Word I have spoken to you’, Racine told the congregation that Jesus has come to brush aside our unworthy past and to bring us to the presence of the living Father without any sense of unworthiness. He made it clear that it is God’s power working through His Word by His Spirit that brings about a new birth and a radical transformation to our lives. “How do we know the power of God?” Racine asked. Recalling the man of God, Prophet T.B. Joshua, as saying that: “To know God’s presence is to know His power” and that “The Word of God is the living presence of the divine power”. Mrs Margareth Molefe, a 56-year-old South African, who suffered from ailments including stiff arm due to osteodegenerative change of the shoulder joint, knee joint pain and a cervical spine problem for 12 collective years. After prayer, she rose and walked freely with renewed strength, to the glory of God! 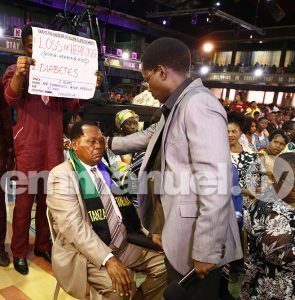 Mr Olusegun, upon receiving the Word of God, removed the body brace his life once hinged on due to the cervical and lumbar degenerative disc disease that deprived him of the ability to walk freely. 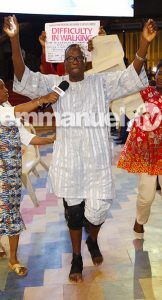 Racine prayed in the power of the Holy Spirit and Mr Olusegun walked with a renewed body in the light of his testimony. 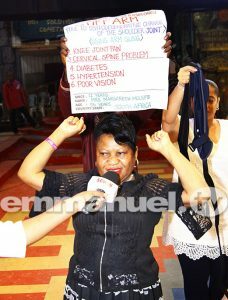 When three years of cervical spondylosis, degenerative disc disease and disc protrusion coupled with a discomforting goitre placed Mrs Sophia Masanja’s neck at the mercy of a neck collar, the 54-year-old Tanzanian knew she had come to The SCOAN as her last bus stop. 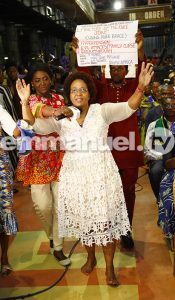 Indeed, God’s healing power put an end to her suffering and the transforming power in God’s Word that Racine proclaimed, set Mrs Masanja free. For nine years, Mrs Layi Petune, a 63-year-old from South Africa, suffered from hypertension and a fractured knee joint among other challenges. 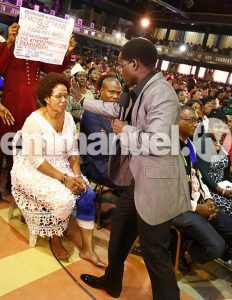 When Racine stretched his hand towards her and prayed in the name of Jesus, Mrs Petune removed the knee brace and walked into her permanent freedom from the ailments. stiff neck and sleep apnea things of the past. 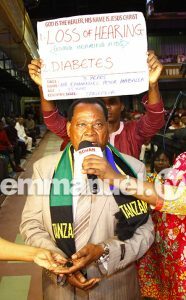 At 75, Mr Emmanuel Peter Mazalla, a Tanzanian, was not prepared for his three years of loss of hearing to extend into another day of his life. At the mention of the name Jesus Christ by Racine, his healing became an instant testimony. 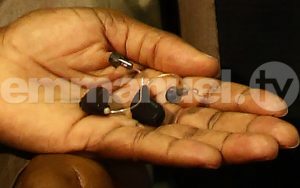 He took off the two hearing aids and became naturally responsive. 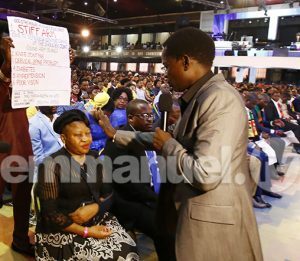 Under the anointing of Jesus Christ, the Master Healer, Chris ministered healing and deliverance prayers and the sick were healed, broken hearts were mended, the weak became strong and the chained were set free. 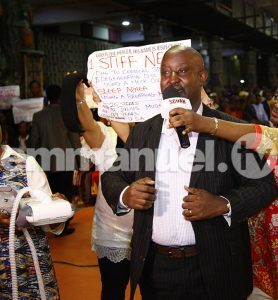 Others were not left out as Words of prophecy were released, exposing the root cause of their problems. 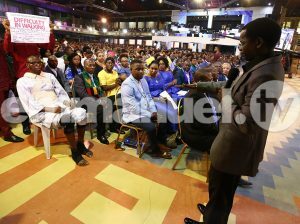 During the Mass Prayer ministered by Racine and Chris, the power of God was present touching many lives and scores began to vomit poisonous substances satan had deposited in their systems. God proved that He is the same, yesterday, today and forever and with Him all things are possible. 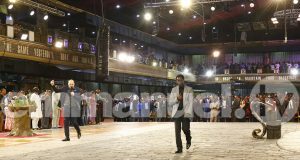 In bringing The SCOAN Sunday Service to a fulfilling close, the Man of God, Prophet T.B. Joshua, offered the Viewers’ Prayer, commanding all unclean spirits operating – causing setbacks, afflictions, failures, diseases, to leave them, in the name of Jesus Christ.